Coming up on M-Net City Movies (channel 115) tonight (March 30, 2018) at 21h00 is Escape Plan. Sylvester Stallone and Arnold Schwarzenegger team up for this intense thriller. A man’s wrongly incarcerated and must break out of the inescapable prison he designed. Escape Plan (formerly known as Exit Plan and The Tomb) is a 2013 American action thriller film starring Sylvester Stallone and Arnold Schwarzenegger, and co-starring Jim Caviezel, 50 Cent, Vinnie Jones, Vincent D'Onofrio and Amy Ryan. Directed by Swedish filmmaker Mikael Håfström, and written by Miles Chapman and Jason Keller (under the anagram pen-name 'Arnell Jesko'). 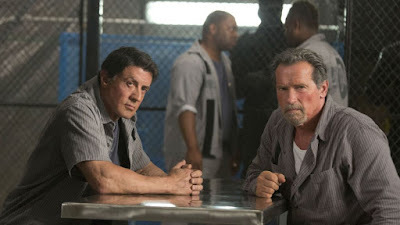 The first film to pair up action film icons Stallone and Schwarzenegger as co-leads, it follows Stallone's character Ray Breslin, a structural engineer who is incarcerated in the world's most secret and secure prison, aided in his escape by fellow inmate Emil Rottmayer (Schwarzenegger). The film has a rating of 16VL.